Europe: Expect a hot summer, with draught and major storms - can Green Roofs help? There we have it. The AccuWeather weather portal has published its summer weather forecast. 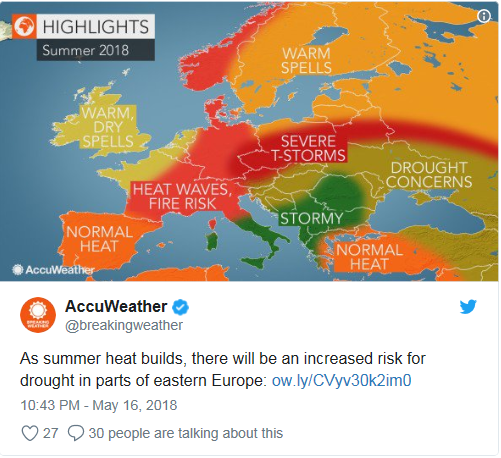 The AccuWeather portal is forecasting weather in the Eastern Europe area from June through August will see high temperatures and droughts. However, no longer heat waves were announced, since occasional major storms are expected to cool the atmosphere, bringing with them hail and storm water flooding. The heat will also cause problems in parts of Western and Central Europe, i.e. in France, Germany and Austria – all the way to the Alps. During the summer months temperatures will often rise above 32 degrees Celsius, while southern France and northern Italy can expect temperatures up to 38 degrees Celsius. There is a high risk of both fires and draught. “There is a chance of a longer heat wave at the end of the summer that could bring with it certain health issues, especially for the more vulnerable population groups” meteorologist Alan Reppert claims. Further, he believes there is also a high risk of bad air quality due to extensive forest fires. Periods of draught between June and end-August will be interrupted by shorter periods of strong rain and winds. Strong storms with wind and hail are forecast particularly for Poland, Czech Republic and Belarus. We might even see tornados, while at the same time we should not expect any extended cooler periods, Reppert concludes. For the south of Italy, AccuWeather has forecast more frequent storms and heavy rain. The same applies to the south of the Balkan Peninsula. Since the area will be completely dry, heavy rains could lead to devastating floods. AccuWeather meteorologists claim that most of Europe can expect a summer that will be a little drier than usual, while summer temperatures will rise above average. Unfortunately, a large part of Europe will not be able to avoid storms, together with hail and storm water flooding. They conclude that occasional storms will prevent any longer lasting heat waves from taking hold. According to AccuWeather, draught will be the main problem in Slovenia this summer. Temperatures will often rise above 32 degrees Celsius, while we will not see any longer periods of precipitation. August will be the hottest and driest summer month, which will have a significant impact on agricultural yields. However, the weather will be a little more lenient on the Iberian Peninsula, where those periods of hot, dry weather will be slightly shorter than last summer, when the area was devastated by vast forest fires as the result of severe draught. 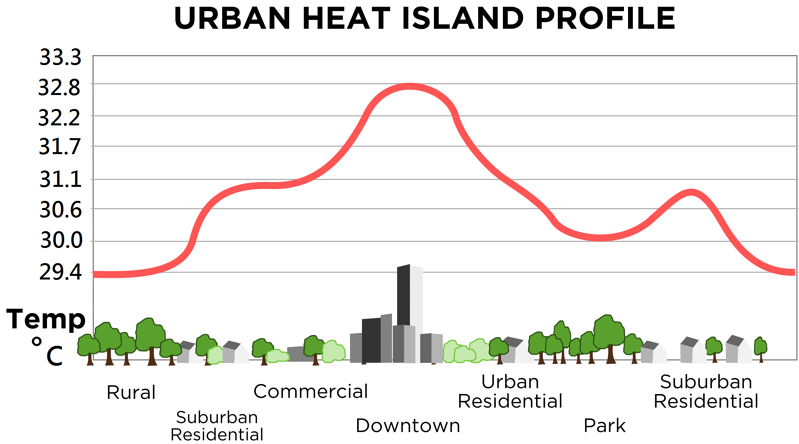 The heat will be extremely harsh in urban areas – also due to the impact of urban heat islands (UHI). As a result of extreme heat and urbanization UHI is continuously – and increasingly – affecting all urban populations in Europe and around the world. UHI is defined as the rise in temperature of any man-made area, in comparison to more rural or green areas or other natural habitats. According to many studies, heat island effect negatively impacts not only residents of urban environs, but also other people and their associated ecosystems located far from the world’s cities. In fact, UHIs have been indirectly connected to climate change owing to their contribution to the greenhouse effect, and therefore, to global warming. One thing is clear – every summer cities are becoming increasingly hotter, regularly breaking heat records for “downtown” areas. How can green roofs help during these ongoing heatwaves in Europe? Cooling the outside surfaces of buildings should be a priority of all municipal areas around the world, and Green Roofs should become one of most common tools with which to combat UHI. Therefore, understanding how green roofs can cool roofs down is of paramount importance. Plants provide good shade and reflect radiation from the sun. Without plants, this component in the UHI-reduction equation is eliminated; having healthy green roofs with a lot of vegetation is therefore the key (starting from the first day of green roof installation). Plants, together with growing media, capture a certain amount of water, which is the basis by which evapotranspiration takes place and thereby reduces air temperatures and generates a net cooling effect on the surroundings. Evapotranspiration positively reduces the effects of UHI, as long as the green roof and the plants on it still contain some moisture. Therefore, we need to make sure to design a green roof that will have enough water dispersed in the growing media such that prolonged dry periods will not dry it out completely. How to design a proper green roof to fight constant, ongoing heatwaves and UHI? The University of Ljubljana, together with the Urbanscape team, have included the Urbanscape Green Roof UHI performance evaluation in the Urbanscape Performance Evaluation Tool (PET). The Urbanscape PET Tool will help you design Urbanscape green roofs and defines irrigation protocols for them, with the aim of achieving the maximum UHI-reduction potential. Read more on calculating the performance of the green roofs. What exactly can be calculated? Download our sample PET Tool Report for a specific city & country and find out more. Download one of our selected Performance Evaluation Tool reports or check our website to learn more about green roofs and their benefits.